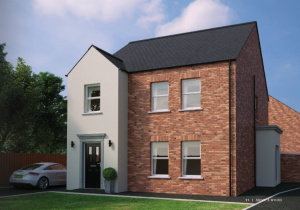 Ballymena based Estate Agents Lynn and Brewster – L&B have released new homes for sale in Cullybackey. Shaw’s Wood is a beautiful new development of ‘picture perfect village homes’ located close to all local amenities. These homes with their red brick and ivory render are available as 2, 3 and 4 bedroom options. Shaw’s Wood is situated close to Tobar Park in the village. The train station is a short walk away and has direct routes to Belfast and Derry/Londonderry. A pedestrian pathway will allow you to be on the Main Street in minutes where there is a good selection of shops and schools (from nursery through to secondary) All this is within a mile from your front door! Close to the new development there is a superb children’s play area and if you want to take the dog for a good walk there’s the nearby Maine riverside walk all the way to Galgorm Resort & Spa. As well as the many amenities in the village itself, there is also a good network of travel options for commuters using either train, bus or car. 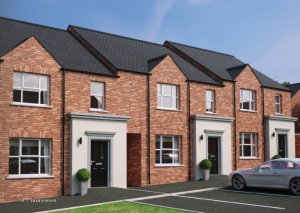 Available now – new homes in Cullybackey’s Shaw’s Wood development. Cullybackey is only 3 miles from Ballymena with its high street brands and larger supermarkets, yet Shaw’s Wood offers a quiet, close-knit village lifestyle. With detached, semi-detached, townhouses and apartments all on offer here, if you are looking for your first home or would like to move home, why not consider a Shaw’s Wood home? Take a closer look at the online brochure here. If you would like to find out more about Shaw’s Wood, the new homes released in Cullybackey by L&B Estate Agents, then give them a call. Their number is 028 2563 7733 and they will be happy to arrange a viewing or answer your query.